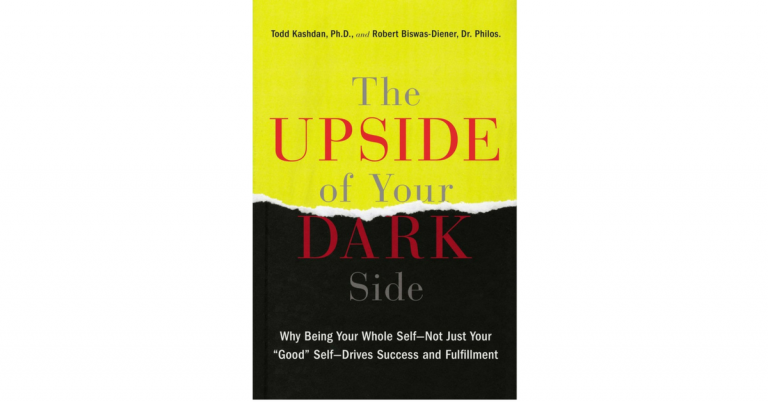 It’s with very mixed feelings that I write this review of The Upside of Your Dark Side: Why Being Your Whole Self–Not Just Your “Good” Self–Drives Success and Fulfillment; and the authors would undoubtedly approve! 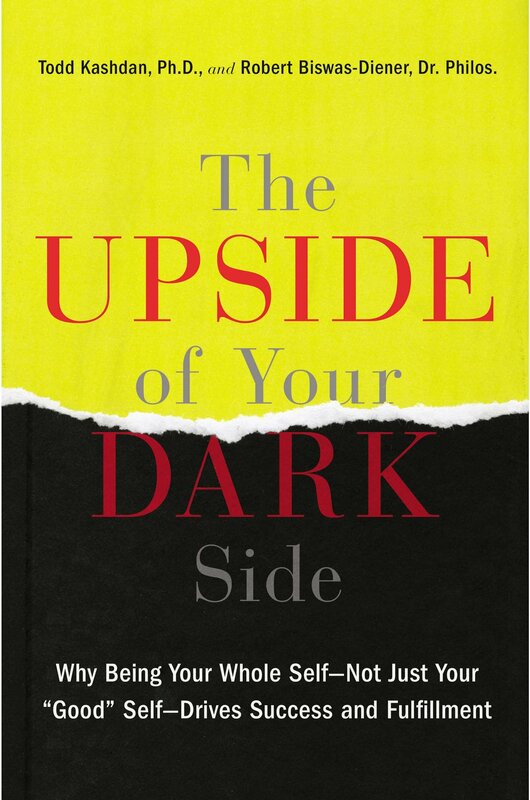 This is a bold and thought-provoking book by Todd Kashdan and Robert Biswas-Deiner (who, in the interest of full disclosure, trained me in positive psychology coaching and was at one point my coach). One the one hand, this book is an incredibly important counter-point to a lot of the emphasis that people, myself included, put on happiness and getting more of it. Perhaps the fundamental point of the book is that we need to be able to handle inevitable hardships and unpleasant feelings in order to ultimately succeed. Not surprisingly, the leading predictor of success in elite military training programs is the same quality that distinguishes those best equipped to resolve marital conflict, to achieve favorable deal terms in business negotiations, and to bestow the gifts of good parenting on their children: the ability to tolerate psychological discomfort….this is what psychologists refer to as distress tolerance. The authors make a point that I always make in The Science of Being Happy and Productive at Work: unpleasant emotions are normal, natural, healthy, and helpful. ows that only rarely does anger turn into the kind of overwhelming rage that leads to violence. Instead, it tends to bubble up when you perceive an encroachment on your rights as a person. Anger stirs you to defend yourself and those you care about, and to maintain healthy boundaries. People who are whole, those of us who are willing and able to shift to the upside or the downside to get the best possible outcomes in a given situation, are the healthiest, most successful, best learners, and enjoy the deepest well-being. We think of this as the 20 percent edge because wholeness describes those who experience positivity 80 percent of the time but who can also avail themselves of the benefits of negative states the other 20 percent of the time. I applaud this emphasis on wholeness. Trying to be constantly blissed out isn’t healthy or helpful. Indeed, our unpleasant emotions can be incredibly useful in the right situations. And a lot of people–myself included–are emphasizing that we should be happier, because science tells us ha ppiness generally brings benefits, and suggests choices we can make to bring more happiness to our lives. So the counter-point is very well taken. On the other hand, I think that The Upside of Your Dark Side takes that counter-point too far. They describe the “fake it until you make it” approach popularized by Harvard researcher Amy Cuddy as “cringe-worthy”. I strongly disagree. While I would never recommend faking happiness all the time, in certain circumstances, it’s exactly what’s called for. If my sister is having surgery in the hospital and I’m worried about her, but there’s nothing I can do at the moment and I’m about to give a workshop, then posing wide with a smile on my face to get in the right mindset is entirely appropriate. If you are driving to work in the morning and feel ‘meh’, but want to spread some positivity at work, then acting just a bit happier than you are as you walk into the office in the morning is a great idea. As another example, the authors have an entire chapter titled “Beyond the Obsession with Mindfulness”. To be fair, they use many paragraphs relaying the benefits of mindfulness suggested by science, but then they spend the rest of the chapter essentially arguing for the benefits of mindlessness. They are trying to contrast with what they call a “cultural obsession” with mindfulness. But science tells us we have no problem being ‘mindless’; in fact experience sampling suggests we are ‘mindless’ about 1/2 of the time we are awake! In a recent presentation of my workshop Empower Your ‘Inner CEO’ with Mindfulness, about 1/3 of the audience had never meditated in their life–and that was an audience who opted to come to a mindfulness session. All of this adds up to the authors fighting against an ‘obsession’ that just isn’t a real problem. I believe the data clearly shows that our society does not have an obsession with mindfulness, and to the contrary, more of us being more mindful more often would bring a lot of benefits to individuals and organizations. Do I recommend this book? Absolutely. For anyone who wants a more complete, refined understanding of positive and negative emotions and what they can do for us, this book is a much needed addition to the literature. But in my opinion it takes its this valuable counter-point too far. That leaves me with mixed feelings about this book. And I’m sure the authors would be pleased to hear that.